Look at this crazy old picture!! Doesn’t it just scream the 70’s??? 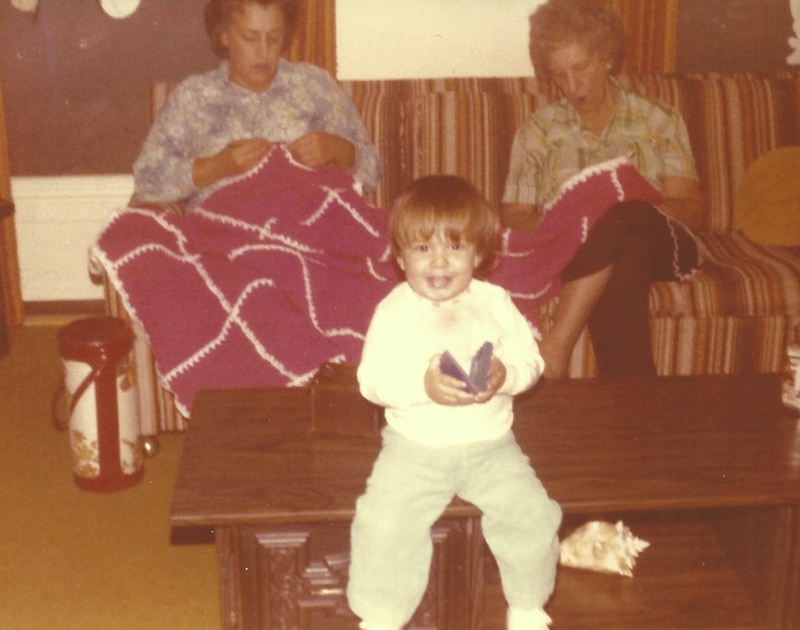 That is my Nanny and GG (her mom) crocheting an afghan on our awesomely striped couch with my little brother Tattoo (no that’s not really his name, but if you watched any TV during the 70’s, then you know who he looks like) in the foreground. I love it!! When we were growing up, Nanny and GG would have these colossal crocheting marathons as they would work side by side on a the latest afghan they were producing. 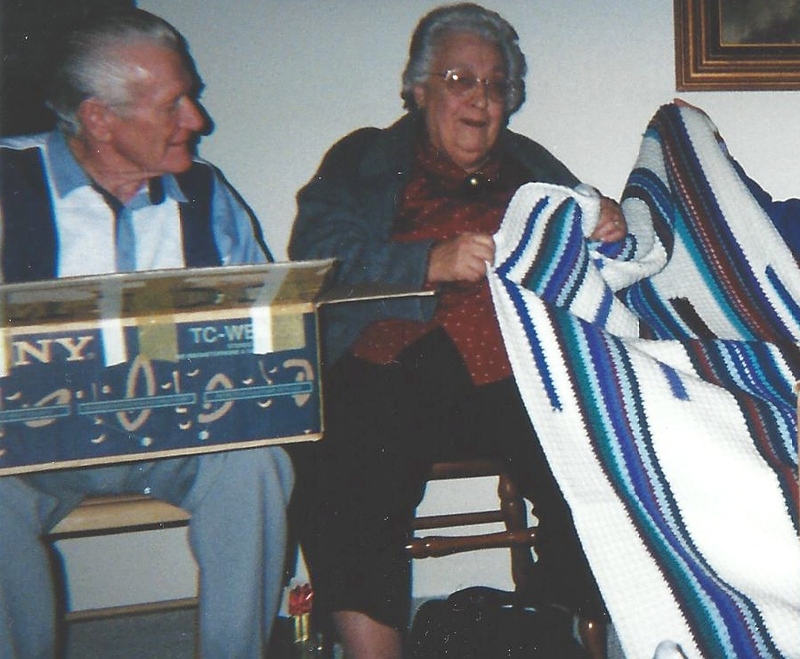 As the years went on, Nanny kept crocheting afghans for everyone in our family…right up until her 9 great-grandchildren and we started to call them, “Nanny Blankets”. Every house you’d go to in our family had several to choose from. Still to this day, 30 plus years later, these handmade blankets warm our hearts, our toes and our souls…we actually fight over who gets to sleep with one when we are all home together at my parent’s house! My “Nanny blanket” made for me while I was in college. Our GG, who passed away in 1999, created her own family legacy by crocheting slippers for everyone in our family, which we fondly called…you guessed it, “GG slippers”. Even into her nineties, she would still crochet these simple slippers or lap blankets and donate them to Veteran’s homes or to shelters. She was onto the “crafting for charity” movement before it was even considered a movement! 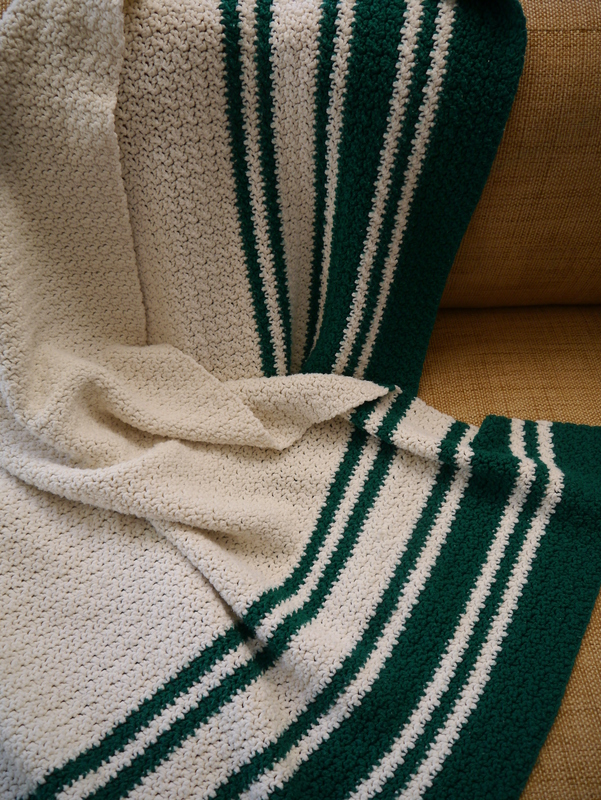 A “Nanny blanket” for Nanny. After GG died, Nanny gave me her bag of yarn balls that she had left. GG used to love to wind the balls of yarn from the skein (usually while listening to a Cubs game on the radio) and I remember helping her with this task on several occasions as a child. I decided to make Nanny her own “Nanny blanket” from her mother’s yarn and the pattern she used to make her own afghans. It took me several months to finish it, but I had it done in time for Christmas that year to give to Nanny. She always said it was the most special gift she ever got and was so proud of me for making my first (and only) afghan. A few weeks before Nanny went into the hospital she sent me (via my mother) a box of her scrap yarn…all balled up of course, just like GG’s. Even though I definitely did not need any more acrylic “granny” yarn, I wouldn’t dare get rid of it since it came from Nanny’s own stash! 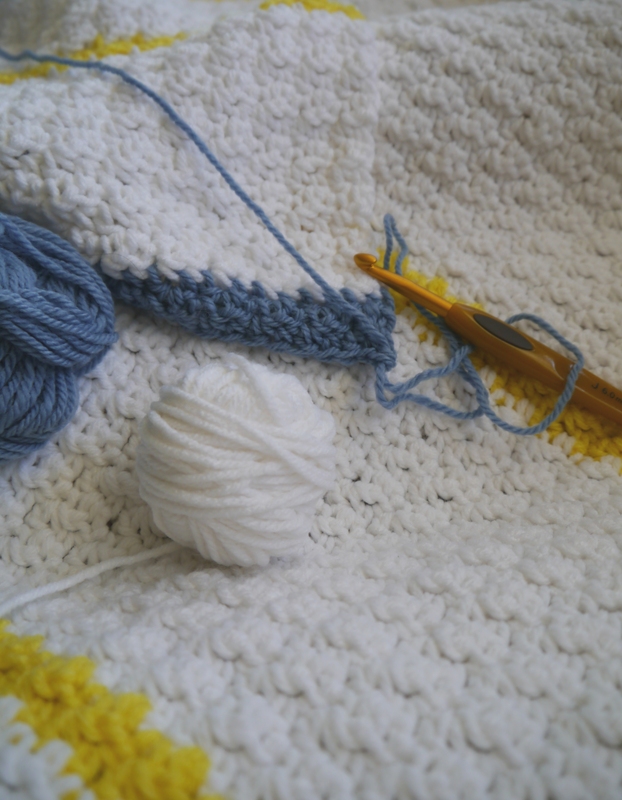 After Nanny was admitted to the hospital, I really needed an outlet for my emotions and I decided to start crocheting an afghan from the yarn she had sent me as way to feel connected to her. As you can see, I didn’t get very far, but the colors looked nice together and I learned a new stitch from it. 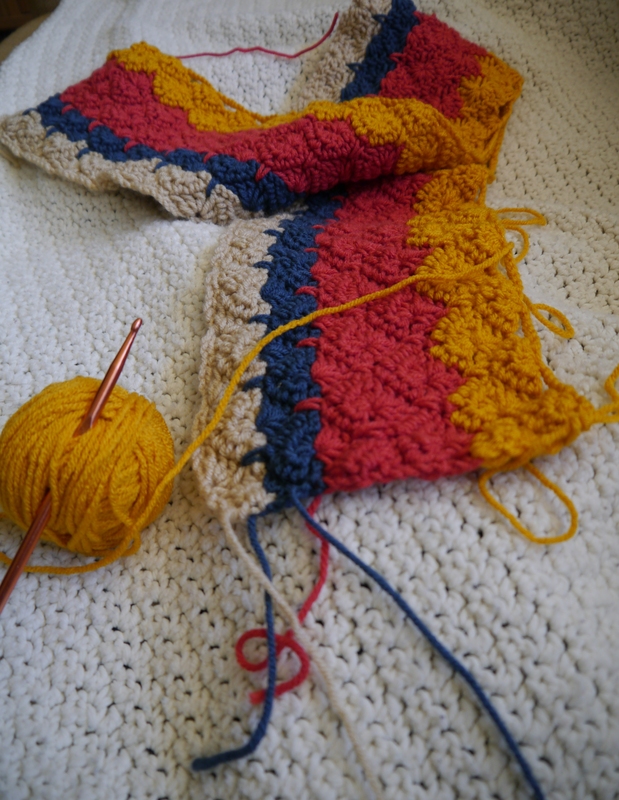 Afghan started with Nanny yarn. As you now know, Nanny passed away on May 1st…God rest her beautiful soul. When I was home for her memorial, the first thing Papa said to me was, “I have something for you from Nanny.” After several rounds of hellos and hugs, kisses and tears, my mom handed me a blue shopping bag with two balls of yarn, a crochet hook and the beginnings of a new Nanny blanket…her last one. Mom said she had been working on right up until being admitted and it sat next to her chair in my grandparents’ living room. It was mostly white with a few bright yellow stripes running through it. When I picked up her hook and started working, I could hear her voice in my head, “It’s a simple pattern, honey…just single, double, single, double…that’s it.” I slept with that blanket on my plane ride back to CA…it smelled just like her and I nuzzled my face into its stitches, holding it tight, wiping my tears. Meta’s crochet hooks and delicate handwork. I was also given (what I now deem as one of my most cherished possessions) the set of crochet hooks that belonged to my great-great-grandmother, Meta (GG’s mother). Nanny had them framed and hanging on her wall above her chair. She had written the dates of Meta’s birth and death on the back of the frame and a small sticker note that said, “Dara”. I guess she always knew that she would pass them onto me one day. I have hung them on the wall in my studio where I get to admire them daily. Meta had taught Nanny to crochet when she was a young girl, just like Nanny taught me and I know how special those hooks were to her. The tradition of passing down a craft is precious and something to be truly cherished. I don’t know if I would’ve ever picked up a hook and yarn if I had never seen Nanny do it or learned how to from her. This craft brings me such joy in the midst of my chaotic days; it fuels my creativity, soothes my anxiety and makes me feel connected not only to Nanny and GG and Meta, but to the community of hand-workers that I’ve been so fortunate to meet, both in real life and online. The sadness I feel over losing Nanny is lessening as time goes on. Thanks in part to a new project I have started, I get to honor her spirit while sharing the gift of crochet that has been passed down to me through her. 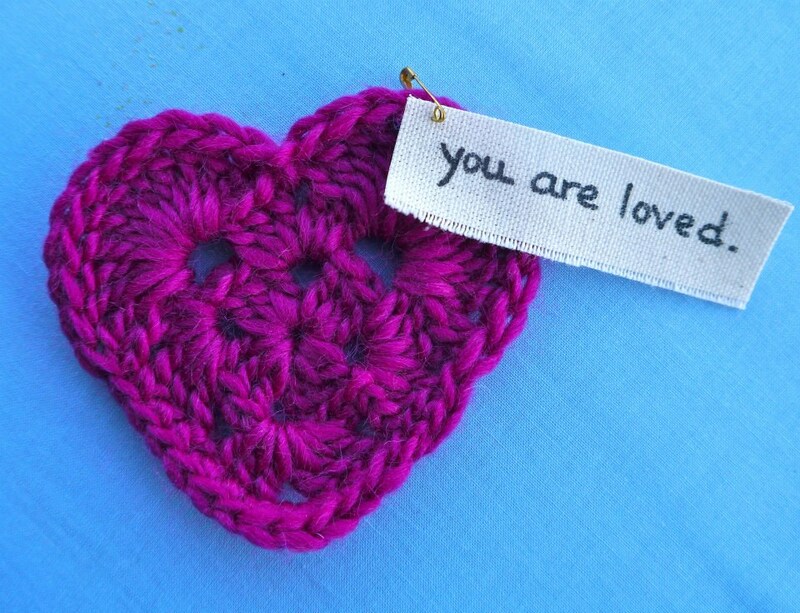 I invite you to take a look at the “You Are Loved” page here or on Facebook to learn more about it…as this post is now turning out to be incredibly long! (You must be related to me if you’ve made it this far.) 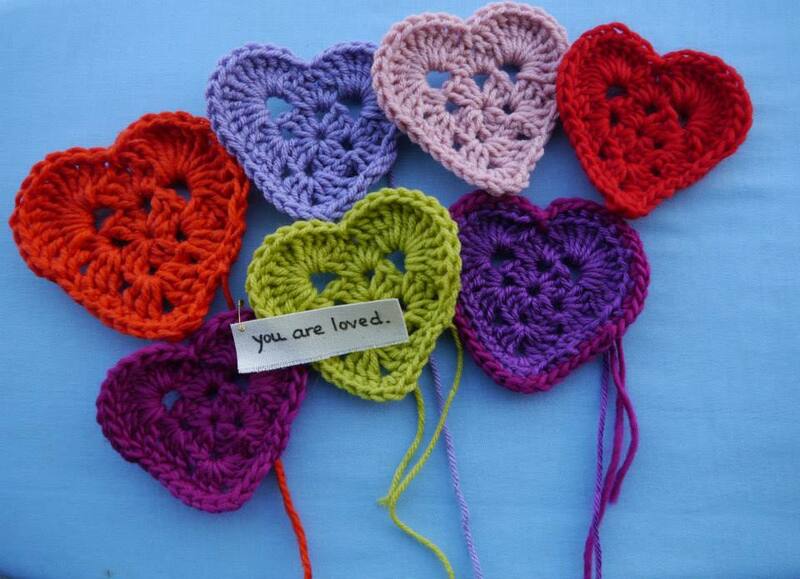 Like the Nanny blankets and GG slippers and Meta doilies that came before them, my hope is for theses hearts to spread a simple message to others while reminding our family of the love that has stitched us together for generations. Dara, you have a true gift of seeing the beauty, simpleness, and connectedness to human nature and true heart. These are the bonds that continuously bind us. I still have my Nanny blanket. I forgot her tradition, their simple beauty, heart, and comfort. Thank you for the reminder of spreading the meaning of love and family. The colours in your Nanny Yarn afghan are gorgeous! 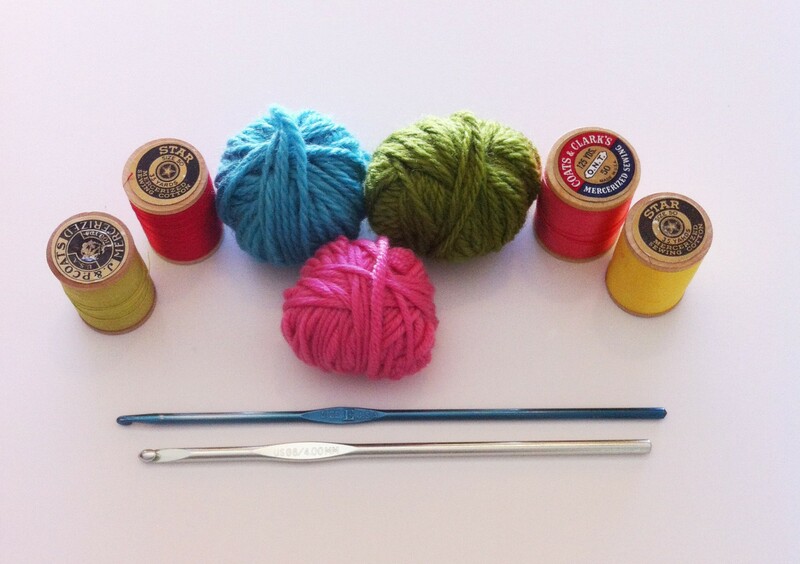 I also come from a family of crocheters, I thought that it must have skipped a generation with me, as I could just never get it, but just recently I picked up a hook and have not been able to put it down and I am loving watching my skill develop. I’m not related to you, but I can totally relate! Thank you for a beautiful post. I also joined the Granny-a-Long and found it so therapeutic! 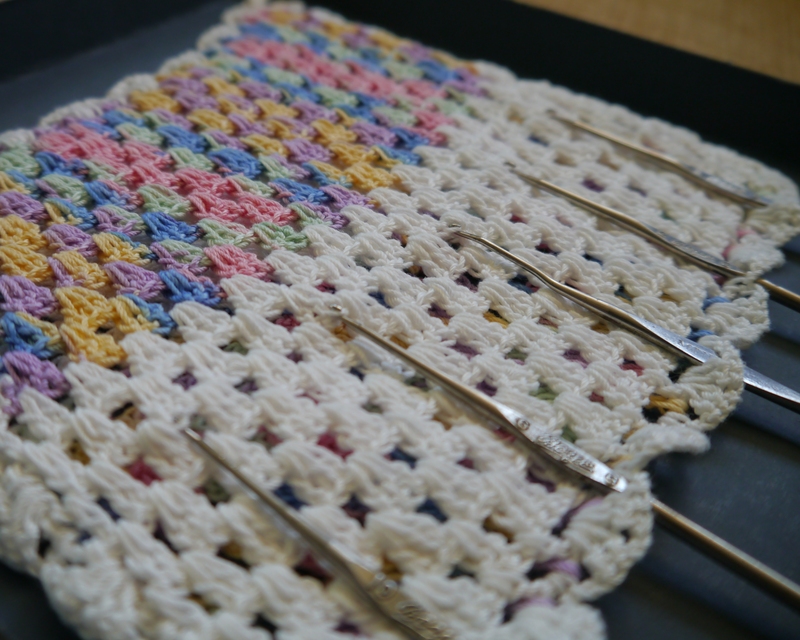 I love to crochet, but my grandmother wouldn’t touch a crochet hook if her life depended on it!